Another peat scientist, Richard Lindsay of the University of East London, said: “If we are concerned about CO2, we shouldn’t be worrying first about the rainforests, we should be worrying about peatlands. One typical large peat site just approved in southern Scotland, the Kilgallioch wind farm, includes 43 miles of roads and tracks. Peat only retains its carbon if it is moist, but the roads and tracks block the passage of the water. The wind industry insists that it increasingly builds “floating roads,” where rock is piled on a textile surface without disturbing the peat underneath. Mr Lindsay said that more than half of all British onshore wind development, current and planned, is on peat soils. In 2011 the Scottish government’s nature protection body, Scottish Natural Heritage, said 67 per cent of planned onshore wind development in Scotland would be on peatland. Struan Stevenson, the Tory MEP for Scotland who has campaigned on the issue, said: “This is a devastating blow for the wind factory industry from which I hope it will not recover. “The Scottish government cannot realise their plans for wind farms without allowing the ruination of peat bogs, so they are trying to brush this problem under the carpet. Scotland’s SNP government has led a strong charge for wind power, promising that 100 per cent of the country’s electricity will be generated from renewable sources. But even its environment minister, Stewart Stevenson, admits: “Scotland has 15 per cent of the world’s blanket bog. In 2008 Dr Smith, Dr Nayak and Prof Smith devised the standard “carbon payback time” calculator used by the wind farm industry to assess the CO2 impact of developments on peat soils. “Large peatland wind farms introduce high potential for their expected CO2 savings to be cancelled out by release of greenhouse gases stored in the peat,” they said. Even the initial version of the calculator found that the carbon cost of a badly sited peat wind farm — on a sloping site, resulting in more drainage of the peat, and without restoration afterwards — was so high that it would take 23 years before it provided any CO2 benefit. The typical life of a wind farm is only 25 years. The researchers initially believed that well-managed and well-sited peatland wind farms could still cut greenhouse gas emissions, over time, compared to electricity generation overall. But now they say that the shrinking use of fossil fuels in overall electricity generation has changed the equation, making the comparison less favourable to all peatland wind farms. “Our previous work argued that most peatland sites could save on net [CO2] emissions,” they said. “But emissions factors [in UK electricity generation as a whole] are likely to drop significantly in the future. The significance of the Aberdeen researchers’ work is increased by the fact that they are funded by the Scottish government and are broadly pro-wind. They wrote in a previous paper that “it is important that wind farm developments should not be discouraged unnecessarily because they are a key requirement for delivery of the Scottish government’s commitment to reduce greenhouse gas emissions”. 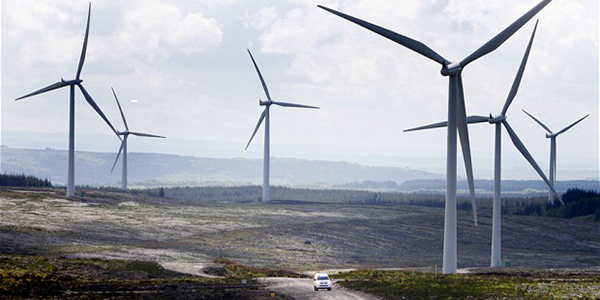 Helen McDade, from the John Muir Trust, which campaigns to protect wild land, said: “Much of the cheap land being targeted by developers desperate to cash in on wind farm subsidies is peatland in remote wild land areas of the UK. The wind industry insisted that the impact of properly managed wind farms on peat and carbon emissions was minimal. Niall Stuart, director of Scottish Renewables, a trade association, said that damaged peatland could be restored in as little as a year. He said the association had signed a “statement of good practice principles” with environmental groups promising that “every reasonable effort” will be made to avoid “significant adverse environmental effects” on peatland, including “properly planned and managed habitat restoration”. Originally posted by The Telegraph here.